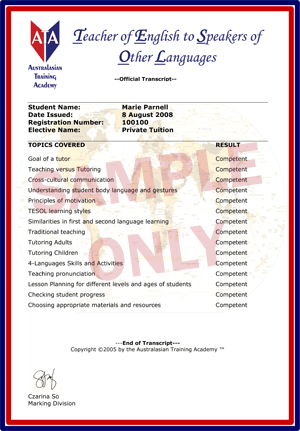 Become certified in Private Tuition and take advantage of the huge ESL market in tutoring English worldwide. Whether one-on-one or in small groups, this is one of the largest money-making fields of ESL teaching. Topics covered include the differences of tutoring and teaching, cross-cultural communication, how to professionally tutor one-on-one or in small groups and the tutoring process. TESOL teachers will learn how to develop activities and lessons to cater directly to students’ needs and learning goals while incorporating their interests. Complete with activities for children and adults, this course even contains a full teaching resource book to get you started! Private Tuition is a must for all TESOL teachers teaching both overseas and domestically. Q: Can I tutor domestically after doing this course? A: Yes, this course covers everything needed for the TESOL teacher to begin tutoring immediately including various resources. Q: How many students can be tutored together in one session? A: Private Tuition covers all aspects of professional TESOL tutoring from how many students per session to where to teach.